Stephen Ireland, Phil Bardsley, Geoff Cameron, Jack Butland and Jonathan Walters ruled out. Bojan Krkić doubtful. Mame Biram Diouf, Ramadan Sobhi and Wilfried Bony unavailable (AFCON). Although Stoke haven't enjoyed a lot of title-winning success in their 150 year old existence, they have fielded the likes of Stanley Matthews, Gordon Banks, Alan Hudson and Dennis Violett through the years. Stoke's most prominent rivals are Wolverhampton Wanderers, West Bromwich Albion, and local club Port Vale; and they play their home games at the Bet365 Stadium (previously known as the Britannia Stadium). Still unbeaten, lets get another winning run going. Think City and Spurs play each other this week. We must win this. At home? I am confused, I thought we already played them at home? Prefer a spurs win or a draw? Need to get back on a winning run now. Draw today wasn't the end of the world all things considered as long as we follow it up with good results. Probably a draw. I'm not too sure about which ones the more likely to drop out of the top 4 at this point, despite Spurs looking brilliant and City looking shite. Would bring us level with City and 3 behind Spurs if we win this. Since we can do feck all against the teams above us we'll need to win this game and every game on the same weekends in which the teams above us play each other. Hoping for a win here and a draw between City and Spurs. Can Ibrahimovic do it on a cold saturday afternoon at Stoke? People forget that we gained a point on City. It means that if City lose against Tottenham and we win then we are in front of them. For all the doom and gloom everyone has that isnt bad by any means. Anyway, really need a win here to get our mojo back. Team should be the same as today. This time we wont be nervous. Ugh, a stream game. It says Old Trafford in the heading but we are away. Information at the top is wrong, it's at Stoke. Why on earth would you put Rooney in the lineup?? Everything else is fine, but put Martial in there, and we should be good to go on another nice run, until Emptihad. 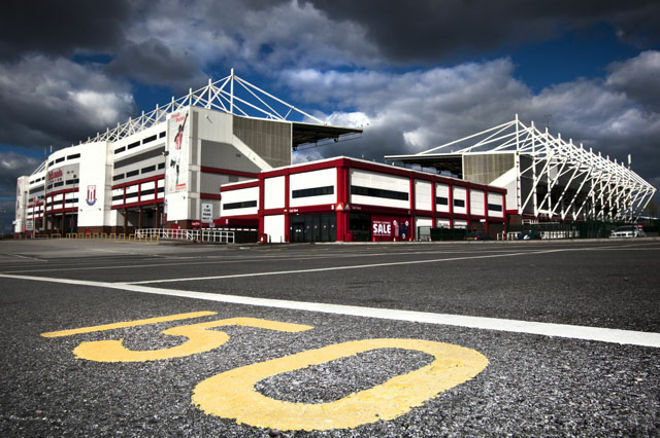 bet365 Stadium Dear me, what an awful name. Lets up our performance again and we can win but this will be hard. I agree. Hopefully we can get the points. Think we're prepared already because the last 30 minutes, we played exactly like Stoke City. That Stoke is long gone. Stoke looked like world beaters yesterday. I expect them to be well up for this. I also reckon they'll go in with pretty much the same team. I'd go with Mata and Mkhitaryan each side. Both worked hard today. A draw again wouldn't surprise me to be honest. 1-1. Nah - that's the play style I remember them by. And those Delap throw ins. We have to win. Failure to win this and we are in danger of losing touch with the top 4 again. This will be a tough game. Just don't see us winning it. Don't think the result today will hurt us too much, the draw means we'll be disappointed but not gutted . Fancy us to get our form back on track in the coming week. Team wise, only issue for me is whether Mata replaces Mkhi and Rashford replaces Martial. Knowing Mou, probably not. I can see this being a real slog. Not an entertaining game. Same 11 as that which started today. I think we'll scrape a 0-1 win, Zlatan scoring a scrappy goal. I'll take any kind of win, we need to keep this momentum going and take advantage of City's likely dropped points against Spurs. Gonna be a tough game, they always show up against us. I'm going for a narrow 0-1 victory. A win next week and the draw against Liverpool looks more like a point gained then 2 dropped. It feels like ages since we had a proper Saturday 3 o'clock kick-off. There was the Boro game but that was New Years Eve. Not confident for this, Sparky is always up for games against us. Wouldn't mind if Carrick is on the bench with Mata starting instead. Shaw back maybe? We need Mata back in this team right now. Himself and Ibra are the only ones that seem to know where the net is. I want to see a more settled XI from now on. Shaw needs to come back in and when there is no Carrick, Mata must start. They think they're our rivals and are always well up for this game so we can't be complacent. Smalling may go in for his heading ability over Jones. Midfield will get loads more space than against Liverpool. Their defence is shocking so the movement of the front three + Pogba will be needed. I just hope we don't play a slow but pragmatic team with Mata and Fellaini because Stoke play physical. Our last 3 visits to Stoke in the league have resulted in 2 defeats and 1 draw. So one point out of nine. They also drew at Old Trafford this season. They're a definite bogey team. Every game is a must win now. I am not going to even contemplate the possibility of not getting three points.